Omniva’s CEO Joona Saluveer stated that the pilot marks an important milestone in the innovation of Omniva’s last-mile delivery. „We are excited and honoured to have the opportunity to be the first testers of this ‘robotic delivery solution’. The pilot will give us essential knowledge and feedback on the possibility of such innovations in our last-mile delivery process,“ said Saluveer. Mercede - Benz Vans and Starship Technologies already introduced the innovative concept back in September 2016. The mothership combines the advantages of a van with those of an autonomous delivery robot. A use-case optimized Mercedes-Benz Sprinter Van serves as a mobile loading and transport hub for eight robots. Thanks to the intelligent interlinking of delivery processes, it will play a part in significantly improving the efficiency of last-mile delivery logistics in future. "We are very pleased to have found an innovative and agile partner in Omniva, with which we will take another major step towards the implementation of our system. The conditions here in Estonia are optimal and we are sure that the experience gained from this test will help us to make rapid progress on the road to Robotic Delivery Solutions, "says Stefan Maurer, Head of Future Transportation at Mercedes-Benz Vans. "This is an important step forward for the future of parcel delivery," said Ahti Heinla, CEO Starship Technologies. "Our first tests with Omniva and Daimler will be invaluable for the future of this new technology." 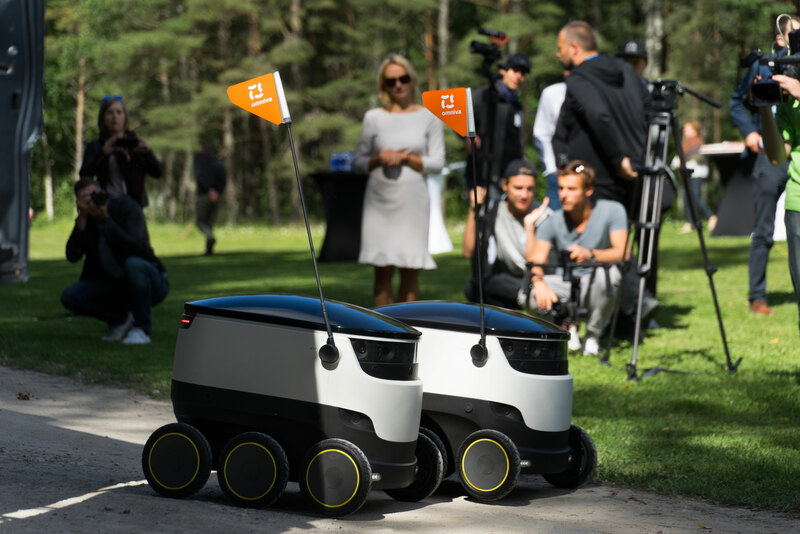 In June The Estonian parliament also adopted legislation allowing delivery robots – such as the ones manufactured by Starship Technologies – on its pedestrian sidewalks. The parliament said that the “last-mile” delivery accounts for about 20-40 per cent of the entire delivery cost and therefore the trend is moving towards using delivery robots to save money. The pilot will be carried out in the suburban region of Kakumäe in northwestern part of Tallinn. The objective is to direct all regional parcel-flow that meets the size-requirements to robot deliveries. Estonian international logistics company Omniva will trial the ''mothership concept'', a prototype autonomous package delivery service using Mercedes Benz Vans and Starship Delivery Robots. The pilot will take place over the summer in a Tallinn suburb. On 23 March 2012, Omniva’s operations were expanded to the Latvian market, with the company starting to provide courier services and opening the first parcel machines in Latvia. Today, the Latvian unit of Omniva has become one of the company’s fastest-growing sections. Member of the board about Omniva parcel machine payment terminal issues. We wish you Happy Holidays - be informed on Omniva's schedule for Easter Holiday period. Omniva’s growth numbers in Latvia reached the finals of the most renowned postal and logistics award World Mail Awards (WMA).